The fourth edition of the IoT Solutions World Congress (IoTSWC) -the leading international event on the innovations of the industrial internet of things-, will gather, from October 16 to 18 in Fira de Barcelona's Gran Via venue, 341 exhibitors and 316 speakers from all over the world with the aim of showing the transforming capacity of the IoT in different industrial and business environments, and also show its alignment with artificial intelligence and the blockchain. The exhibition area will bring together the leading companies in areas such as IT, software platform developers, hardware manufacturers, security companies, telecommunications and service operators, or industrial automation firms to show attendees their latest solutions and applications. Among the 341 exhibiting companies are ABB, Cryptoquantique, Dassault Systems, Deloitte, Fiware, Google Cloud, Hitachi, Huawei, Intel, Kaspersky, Libelium, Microsoft, PTC, Relayr, Rigado, SAS, Software AG, Telefonica, Telit, Thinstream, Uptake, Verizon, Vodafone and Wipro. The event will have a testbed area with live demonstrations of innovative industrial internet applications. In total 10 examples will be showcased, including an intelligent platform to control water quality in Alaska and save beluga whales; an intelligent entrance gate that opens when the owner arrives and can transform a garage into a giant mailbox for the delivery of online purchases; a 3D printing solution that analyzes a customer's foot in real time and produces custom-made shoes in two hours; and a fully connected and sensorized fire truck. The congress will feature some of the leading experts in IoT technology and representatives of various industries to analyze the impact of IoT solutions in different environments. Nine core themes have been established for the 2018 edition: connected transport, product manufacturing, healthcare, energy and utilities, construction and infrastructure, open industry, enabling technologies, blockchain and artificial intelligence, with these last two having their very own forums. 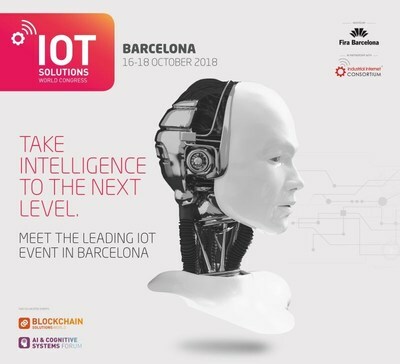 Organised by Fira de Barcelona in collaboration with the Industrial Internet Consortium (IIC), IoTSWC has registered a new growth in the number of participating companies, from 240 in 2017 to 341 in 2018, and expects 14,000 attendees from 114 countries. The event is part of the Barcelona Industry Week, a brand which also comprises two more trade shows, In(3D)ustry From Needs to Solutions, dedicated to additive manufacturing, and Healthio, specializing in health and healthcare technologies.